Dan Wilson plays at a Friends' event in Tunbridge Wells, England. The Friends of the Pianola Institute provides an ideal means for individuals with a love of pianolas and their music to join in the activities of the Institute. 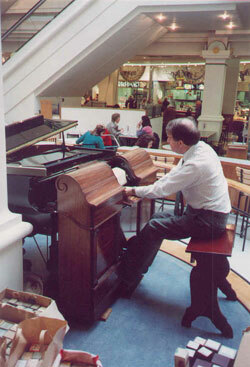 Membership of the Friends includes a subscription to the Pianola Journal, a quarterly newsletter, complimentary copies of the Institute CDs as they are issued, priority booking for Institute concerts, preferential rates for Institute publications and recordings, and an informal advice service on problems connected with player and reproducing pianos. For those living in Great Britain, our House Concerts have become a popular feature of the Friends' activities, and we sometimes organise more practical events, by playing pianolas in public places, or by helping to run the Institute's roll perforating machine. For a more detailed look at past and present activities of the Friends of the Pianola Institute, browse through the different pages listed on the left. If you would like to enrol as a Friend online, please click here. The annual subscription rates are currently £14.00 for members in the UK, £15.00 for those in the remainder of Europe, and £22.00 for all other members. Friends may order back issues of the journal for only £5, including postage and packing!